Horse shows can sure be stressful, especially when it comes to making sure both you and your horse are on top of the game. Follow along with these tips and tricks to help make your show easier and worry free! 1~ Have a cleaning session with some barn buddies a day or two before you leave for the show. Clean out and organize your tack trunk to make sure that you have everything you need. 2~ Create a checklist of all the things you will need for the horse show. Once you have created the list, gather all of your needs and check it off the list. 3~ Arrive at the showgrounds about 30 minutes to an hour earlier before you need to be there. Take this time to learn your courses and possibly hack your horse if needed. You can also use this time to clean and put on some finishing touches. 4~ Check in with the person working at the in gate several times throughout the day so that you are on top of when your class starts. 5~ Be sure that you and your horse are both well hydrated before showing. You may want to consider having an extra water bucket for your horse, as they made become very thirsty after a long day of showing. Also consider bringing your own cooler or ice box to the show. Fill it up with lots of water bottles and healthy snacks. When you are all done showing for the day, hose off your horse if it’s a hot day. 6~ Check the weather forecast for the week when packing. This will make sure that you and your horse are ready for whatever Mother Nature throws your way. 7~ We all have to thank our horse after showing with treats, but don’t give them too many. Too many treats can be bad for your horse and give him/her a belly ache. My favorite treats to give my horse are Best In Show Cookie Company, which only have natural and fresh ingredients in them. There are many different flavors too! 8~ Create your own portable grooming kit. You can use a backpack or purchase a plastic grooming tote at a tack store. A grooming kit can be very helpful, especially to clean up between classes. You can fill your kit with whatever you want. Mine includes brushes, a hoof pick, hoof dressing, fly spray, baby wipes, water bottles and a towel or rag. When I go to bigger shows where you will need something to get around, we take our golf cart and keep our tote on it. 9~ We all have to thank our horse after showing with treats, but don’t give them too many. Too many treats can be bad for your horse and give him/her a belly ache. 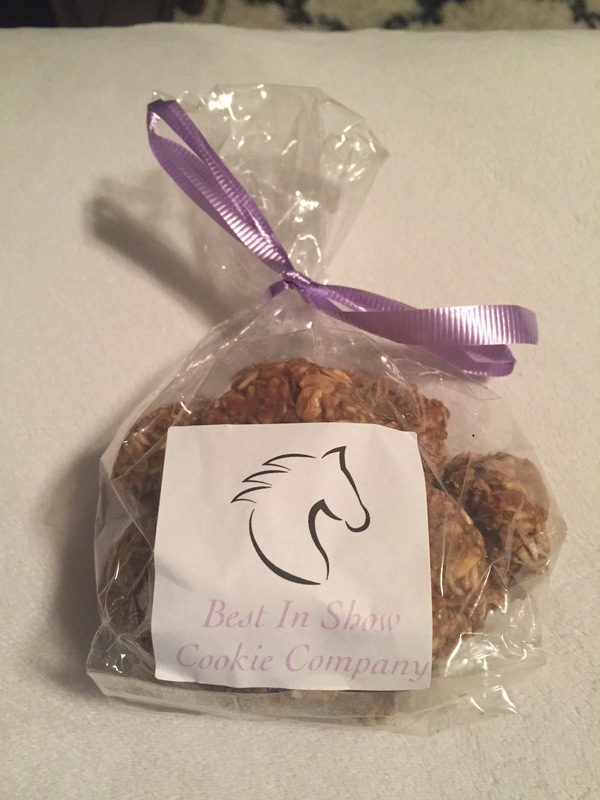 My favorite treats to give my horse are Best In Show Cookie Company, which only have natural and fresh ingredients in them so there is no harm done if you give your horse a few. There are many different flavors too! 10~ Be sure that you and your horse’s wardrobe meets the show’s requirements. Proper bits, whip length, attire, and more. Read over the USEF rule book to find important information like this. 11~ Mind your manners in the school ring or in a flat class. When passing, use the rule left shoulder left shoulder and give each horse lots of room. If you are jumping in the warm-up ring, call a jump by saying “heads up vertical!” for example so people can move out of your way. In a busier arena, don’t walk next to a friend on horseback, as these people are very hard to ride around (and annoying) especially when trying to jump. If your horse tends to kick or bite, use a red ribbon to tie in the tail. This is a sign for people to give you room unless they want to get kicked! 12~ If the show allows people to school their horse in a ring, take this opportunity! Horses can be some confusing animals; scared of things that move and things that don’t. Take this time to hack your horse around the ring you are showing in to make sure that nothing unexpected happens. If your horse is spooky at something, take him/her around it several times. Keep in mind what your horse is looking at when you show so that you don’t get marked off for a spook. I hope these 12 tips were helpful for your show season!